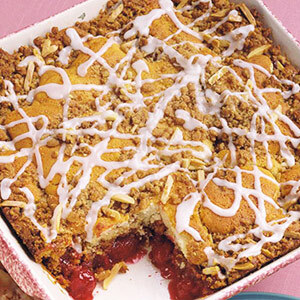 A can of cherry pie filling and box of white cake mix speed prep time on this easy coffee cake. The recipe comes from a reader in Robinson, Illinois, home of the Heath bar. You'll use more than 2 cups of almond-brickle pieces in this cake. Prepare cake mix according to package directions, except stir in one package of the almond brickle pieces. Turn mixture into greased and floured 13x9x2-inch baking pan. Spoon pie filling over cake batter. In a mixing bowl, combine flour, brown sugar, and cinnamon; cut in butter until crumbly. Stir in almonds and remaining brickle pieces; sprinkle evenly over pie filling. Bake in a 350 degree F oven for 1 hour or until a toothpick inserted in center comes out clean. Cool for 30 minutes on wire rack. Combine powdered sugar and enough of the water for a drizzling consistency; spoon over cake. Serve warm or cool. Makes 15 servings.